I’ve been absent from the blogosphere for over a week now, spending time with family, and old friends, back home. And I’ve been thinking a lot about family. About my family. About my brother Terry, of course, who died recently. About his wife and daughters. About my mum. 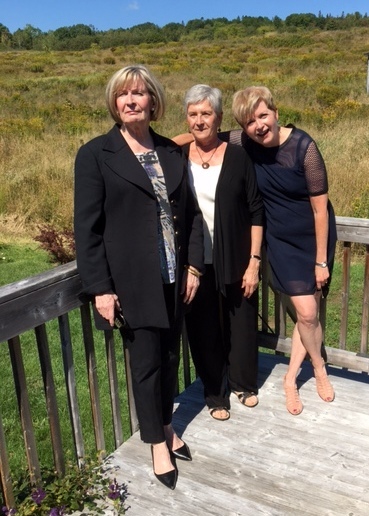 And my sisters and step-brother, as we all gathered back in Fredericton for Terry’s funeral. And I’ve been thinking what an odd phenomenon the whole concept of family is. And about what it means to me. What it literally means… as in how I would even begin to define that word. You see, I come from the original blended family. Back in the day, there were no other kids I knew whose mother had a different surname, who had a step-brother, and a grandmother who wasn’t really their grandmother, or cousins who weren’t actually cousins. I just knew who I knew, and loved who I loved. So what did blood or surname really matter, anyway? I was reminded of this idea, of the meaning of family, at the reception following my brother’s funeral. I came up behind two cousins, tall, handsome men in their fifties, sons of my mother’s brothers. I squeezed between them, put my arms around their waists, and said, “How did I ever get two such handsome cousins?” And one looked at the other and chuckled, “We’re adopted.” And so they were. Both of them, by two of Mum’s brothers, making them Sullivan cousins to me, and to each other. One of them, my cousin Mark, gave Terry’s eulogy, pointing out that Terry was effectively his older brother, this eldest male cousin whom he’d always admired. So, cousin, brother… does the title really matter? You know, it makes me feel a little guilty to think of how much I enjoyed that reception. Seeing so many people from Terry’s and my shared past. Family and old friends who hadn’t seen him regularly for years and years were there. Men who were friends with him when they were boys together getting into mischief. One in particular, who I hadn’t seen since I was a kid of nine or ten, introduced himself to me, and I yelped and hugged him, and said he must be sure to talk to Mum before he left. “Will she still be mad at me, do you think?” he asked with a grin, referring to a long-ago scrape which was legendary at our house. “Probably,” I said. And one woman, my sister’s friend, whose brother was Terry’s best man at his wedding, and who I remember coming to our house with her boyfriend when I was about eleven. They’d heard that my cat had run away, and they brought me a kitten. I wish I’d thought to share that memory with her, but I didn’t remember it until later. And another old friend of my sister, who dated Terry when I was little, and whom I always loved. I was so happy to see them all. These people who felt like family to me growing up, like extensions of my big brother and sisters. And really, who’s to say they’re not family? The Burpee girls together again. As we gathered at my Mum’s house later that day to eat sandwiches, we laughed and shared memories of the day. Of the three men who had stood in a row, grinning at my sister, asking if she remembered babysitting them. She laughed, and said that she looked at them and thought, “You’re old. How could I babysit you?” I guess three or four years makes a big difference when you’re fifteen… and no difference at all in your sixties. It was wonderful to be together with both of my sisters again. We haven’t been home at the same time for many years. And my step-brother too, who flew in from Calgary. Because even though he only met Terry when he was twelve, when his father married our mother, they’ve been brothers ever since. You see, my mother was widowed very young when my brother Terry and my two sisters were small. Years later she married my father and they had me. But we always remained close to her first husband’s family. And so I grew up with an extra grandmother, which didn’t dawn on me until I was about eight or nine, and I asked my mum how come I was so lucky as to have three grandmothers. And all those extra cousins, who, it transpired, weren’t actually my cousins by blood. One summer when I was in university, Mum and I went to stay for the weekend with Nana, and I went out for the evening with my “cousin” Robert who is the same age as me. He stopped to pick up a friend of his, and introduced me as his “cousin, but not really.” We laughed as I explained. Then when I asked this other boy what his last name was, and he said Sullivan, well, the penny dropped. “Who’s your father, and grandfather?” I asked. He told me, and then chortled, “I suppose you’re going to tell me that I’m your cousin, but not really.” “No-oo,” I said, amazed, “I think you really are my cousin.” Ha. And so he was. His father was my mother’s first cousin, and growing up many miles apart we’d never met. I love that story. But that’s probably way too many cousins for you. A cousin too far, you might say. So I’ll stop. I’m not sure what I wanted to say in this post. I’m certainly not going to try to define what the word family means. But I do know that, to me, it doesn’t have much of anything to do with birth certificates, and blood, and who was married to whom. Don’t get me wrong, I love to research my family background, and see where my ancestors came from and when. I love family stories, which you’ll already know if you’ve been reading my blog for a while. But how to explain family ties? Well, we know who we know, and we love who we love. I guess. I do know that seeing all these people I know, and knew, and love, and loved way back when has helped me deal with the loss of my brother. Tears and laughter,remembering old times and not so old times,all the memories that we shared together,memories we forgot or stories about events we didn't know at all…..everything intertwined at receptions after funerals,together with family and friends and others…. You make me cry and you make me laugh….a couple of times. Thanks Dottoressa. Crying and laughing seem to go together at funerals, don't they? I feel such warmth in this post and sense the joyful falling away of years that comes when re-meeting special people from our past. I'm glad you were able to reconnect. Thanks for sharing this. Aren't funerals amazing in that people, families, get together again and reconnect. Funerals are certainly sad occasions, but they bring us together in these hectic times we live in. I love reading your posts Susan. Well sometimes I think wakes are the thing that brings all the family together again and leaves all with a sense of oneness as being the memory they take away from the funeral. I have 11 cousins and grew up with those who lived on the island as though they were siblings. Most of the 11 are still very close, in fact six of us girlie cousins went on a cruise together a couple of weeks ago. My hubby had a totally different upbringing and has three and he's never been really close to any, so he finds it strange that I meet up regularly with mine, whether they live on the island, in the UK or in the IOM. But he loves being part of a big family now. 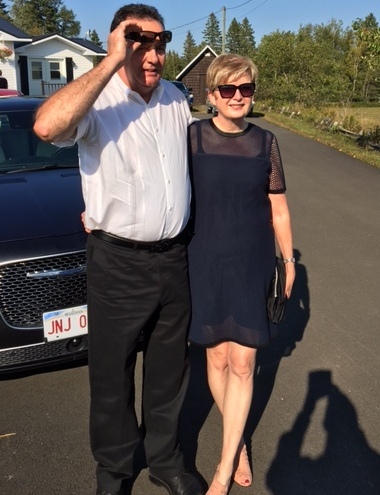 Thanks for your thought-inspiring post, Sue and I hope you and your family are doing well. Hugs, x. Thanks, Mary. My family is so far flung… and we only seem to get together at events like funerals, or weddings. This was a lovely read. We often see extended family only at funerals, but we did gather (at least one side of my large family) a few years back for an aunt & uncle's 50th anniversary party. It was so wonderful to see cousins I hadn't seen in years. Like you, I was flitting about from conversation to conversation. My DH is from a small family with only a few cousins, so like your hubby, he just gives up after a while. Ha! My parents are both from big families (8 kids in each) and I have 63 first cousins. Needless to say, we were closer in age to some than others, but it's always nice to see them whenever we get together. Your brother would have loved your story. You're right. Sometimes a funeral is a touching time to reconnect with family. I could not keep track of your family but I'm so happy that you were surrounded by love. I also noticed you crossed your legs in the photos to present yourself in a cooler hip way! Loved it. Ha. Thanks. But crossing my legs has become a habit, formed when my legs were sooo skinny that I looked like a forked twig in photos. My mum was one of fourteen children & my dad one of six . So I have over sixty cousins dotted around but we are not close . My mum said it just wasn't possible in a family of that size . The eldest left home before the younger ones were even born , often to live many miles away & traveling was expensive , when possible . There wasn't time in busy working lives to catch up with such a big family regularly . I smile when people investigate their family tree & are so excited to find new cousins . Apart from a dozen or so , I wouldn't recognize my lot ! As you say , we know who we know & love who we love . I'm glad you were able to get a little pleasure from the funeral , I'd like to think there will be some laughter at mine too . So how tall is that cousin of yours ? He towers over you . That's a lot of cousins, Wendy. But not as many as Laurel, in the comment above:) Clearly, like you, I wouldn't recognize most of mine beyond a few with whom I've stayed close. You're right my cousin Mark is… really tall. He must be over 6'4". If he weren't adopted we'd probably say he got his height from my grandfather Sullivan. I enjoyed my mom's funeral too. I reconnected with old friends, some of the friendships have been rekindled. And it was fascinating to hear the eulogies (she was a somewhat "public" figure) from all sorts of people, and hear different perspectives of her than I had ever experienced. Your post is beautiful and a wonderful tribute to your brother. Families…it's the stuff of great novels. Thanks. How wonderful that you saw so many new sides of your mum at her funeral. I liked the detail about your adopted cousins. As mother of an adopted son I can only agree with you: we love who we love, and those are the ties that bind us together. Thanks, Eleonore. Ties that bind, indeed. My father's funeral lunch was a very jolly affair – a proper, slap-up Yorkshire tea, the kind he loved best, lots of friends and plenty to drink (thanks to my brother who made sure we could loosen up) and we all sat about chatting in a warm autumn sun. The only thing missing was him. Weird. I think we are all so relieved to have got the rites over and done with – and trying not to dwell on what happens next – that it is pleasant to chat and catch up with people. There is always room for some humour and happiness in the midst of sorrow. Ummm … ummmm … ummmm! Love this more than I can type. You made me cry. The good kind. Thank you, Sue. Ah, thanks, Ann. That's high praise. Lovely post, Sue, and it dovetails with some stuff I've been thinking of lately in ways I won't talk about here but would if we met for lunch again. . . . Thanks, Frances. Wish we could meet for lunch again. Like Melanie, I sensed such warmth in this post Sue … a joy to read. Somehow I always feel a little sad at funerals that all the people who made such an effort and in some cases travelled hundreds of miles to be there hadn't been able to get together whilst the person was alive…Ive definitely felt this at the last few family funerals I've attended … such is life. Hope you're having a great camping trip … not long now until your UK trip. Exciting! I know. Reminds me of that episode of Mrs. Brown's Boys where they give Grandad a funeral before he dies. Getting excited about England… or I will be when I'm done doing all the laundry from our camping trip.